There are very few truly unique instrumental sounds in the world of music. Sounds so distinct, so compelling, so immediately identifiable and genuine that you just have to have it. Nothing else will do. "Close" won’t do. "Almost" won’t cut it. "Approximately" will instantly brand you as a shallow imposter. One of these really great, unmistakable instrumental sounds is the tonewheel organ, such as the classic Hammond B3. The Hammond B3 was used by many great rock, soul and jazz artists in the 1960’s to 1980’s. Unforgettable musicians like Stevie Winwood, Jon Lord of Deep Purple, Jimmy Smith and Richard “Groove” Holmes. Great music, great sound, created on an absolutely great instrument. That’s what you want. And that’s what DB-33 Tonewheel Organ gives you. 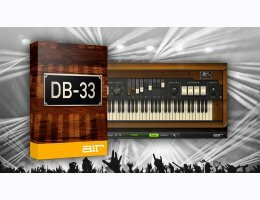 DB-33 Tonewheel Organ is a virtual organ that recreates the sounds and controllability of classic tonewheel organs such as the Hammond B3, and the rotary-speaker cabinets they are often played through. It includes 122 preset sounds plus an extra-realistic convolution rotary cabinet and tube overdrive emulation. The rotary-speaker cabinet can also be used as an effect in its own right on an audio track. iLok optional - This product requires an iLok account for authorization. You may choose to authorize on your computer or an iLok 2/3 dongle.